Only a few days and a few tickets left for the summer cabaret night Balzunetta Towers, to be performed at Pjazza Teatru Rjal from the 11th to the 16th July 2017. Commissioned by the Valletta 2018 Foundation and making part of the Malta International Arts Festival 2017, Balzunetta Towers is a contemporary theatrical cabaret. The original show treats one of Malta’s most flagrant well-kept secrets – Balzunetta – known by many as Strait Street’s naughtier sister, albeit in Floriana. Ironically, Balzunetta was surrounded by the Maltese Curia, the Police Headquarters and the Army Barracks. Over the years, researchers have unearthed some spine-tingling memoirs and glamorous tales surrounding Balzunetta. Many would agree that these infamous stories deserve a proper artistic treatment. The show involves more than 100 people, amongst whom is established cartoonist Seb Tanti Burlò who collaborated on the set design together with Norman Hili “Iċ-Ċiċċio”, known for his work on Carnival floats. Together with lights designer Andrew Zammit, these three are working on what is said to be the largest stage at Pjazza Teatru Rjal. The cast includes well-known actor Davide Tucci, comedian Chris Dingli, and singer Doreen Galea as a few of the big names to premiere in Balzunetta Towers. Amongst the voices jazzing up the score are Ozzy Lino, Josef Camilleri from Xarulu’, Justin Galea of KażinSka fame, and the very talented Mariele Żammit. Theatre veterans Michael Mangion, Peter Busuttil, Antonella Axisa, and many more will be starring alongside. Choreographer Jo Butterworth, cartoonist Seb Tanti Burlo’ and designer Adrian Mamo will be among the creatives in the show. Dominic Galea on Balzunetta Towers, “A tribute I have been dreaming of for a number of years. It is wonderful to have it produced on such a spectacular scale. The stories of my iconic birthplace will be finally brought to life. The music is inspired by these nostalgic times, times where my father’s roots as a musician lie. You can feel the teams’ heart beating in the project, we’re all in love with it. It is already a pleasure being part of the process and I can’t wait to play those notes live on stage with our fabulous cast and band”. 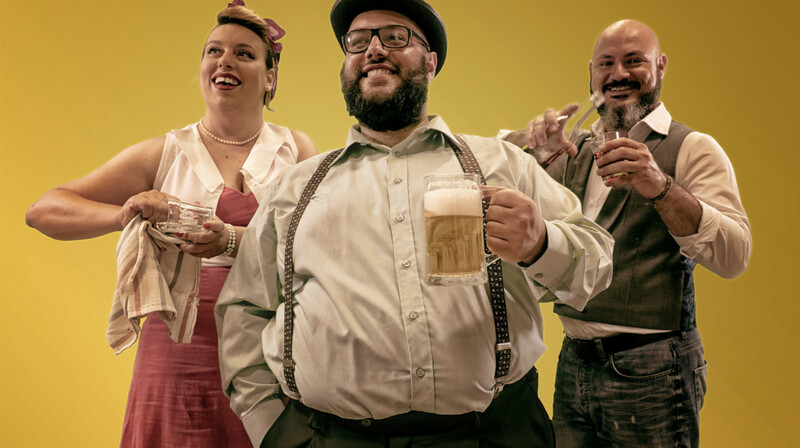 Pjazza Teatru Rjal will get a nostalgic make-over and turn into a spectacular cabaret stage featuring a live orchestra along some of Malta’s finest voices, actors and dancers. For the first time ever, the stalls will be transformed into cabaret-style tables which will host the gold ticket holders who will be served flowing wine, nibbles and given a free recording of the show’s musical score. The show is also supported by Delicata Wines, Nenu the Artisan Baker, Teatru Manoel and the Floriana Local Council. The show is in Maltese with English subtitles and will run from the 11th to the 16th July 2017 at Pjazza Teatru Rjal. Last few Silver and Gold Tickets are available from www.balzunettatowers.com or 21223216.